TROUT: In Southern California, Irvine Lake planted two weeks ago, but the bite has slowed since. Santa Ana River Lakes kicks off its season this week, and the Big Bear Lake and Jess Ranch Lakes in Hesperia are probably the best bets. The DFW also kicked off its urban lake plants last week and another big batch of fish are going in this week. 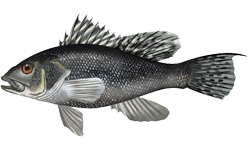 BLACK BASS: The bass bite is starting to slow with fewer and fewer fish up chasing baitfish, and the window for this action is shrinking even when they do come up. More and more fish are suspending and holding in deeper water on points and live bait, plastics and jigging spoons (or ice jigs) are becoming the go-to baits. Top bets are Casitas, Perris, Castaic, and Diamond Valley. Lower Otay, Piru, and Pyramid are also still fair. On the Colorado River, the smallmouth and largemouth bites have also been fair from Lake Havasu south into the lower river backwaters and up in Lake Mohave and this is still mostly a reaction bait bite. STRIPED BASS: The striper action had been fair to good across most of Southern California’s reservoirs. Pyramid is still fair to good, and Castaic, Silverwood, and Skinner are all fair. More and more bigger fish are starting to show with trout plants beginning. Castaic got it’s first plant this week. Diamond Valley remains a blank slate with no fishing pressure, but a few fish showing for shore anglers throwing swimbaits. The best fishing in the region, however, has been the California aqueduct near Taft with good action now and the top fish reported this week was a 24-pounder. On the Colorado River, the bite is fair to good from the Bullhead-Laughlin stretch down river into Lake Havasu. Lake Mohave is also fair on stripers. PANFISH: Not much to report here. Fishing pressure is light and most of the bites have slowed way down. An exception is the bluegill bite at Lake Skinner which has come back on the last couple of weeks for fish in deeper water. Perris slowed but a few fish are still being landed. The Casitas crappie bite tanked, and only a few crappie are showing from Cachuma Lake. CATFISH: Every place is slowing down. Lake Skinner continues to have a fair catfish bite on cut baits, especially chicken liver. There also continues to be fair action on cats in California aqueduct near Taft, but the formerly good bites at Cachuma, Lake Isabella, Silverwood, Piru, Pyramid, and Castaic all ticked down a notch this past week.